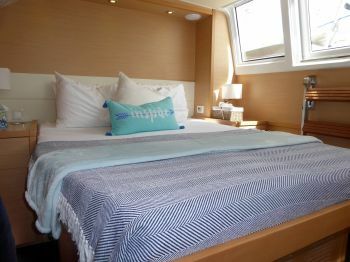 Master Queen + VIP Queen + 2 Guest Queens, each with private bathroom with stall shower. 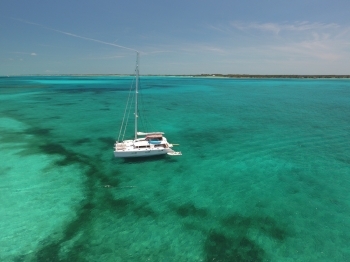 Arriving in the Bahamas in mid-May, 2017 from the Virgin Islands, the beautiful 62′ Lagoon catamaran TIGER LILY will charter in the Exumas, Abacos, Bimini, Eleuthera and the Berry Islands for the summer, and the crew are excited about it! 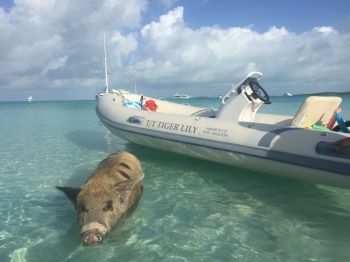 It’s fun to explore new destinations, and what better destination is there than the sandy atolls and turquoise waters of the Bahamas, famous for their excellent spearfishing and diving. 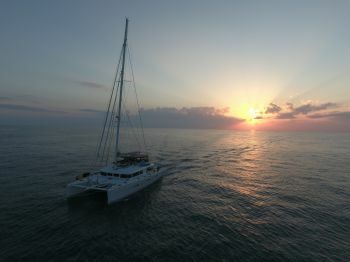 Arriving with TIGER LILY is one of the Virgin Islands best charter crews, Captain Cameron Roocken-Smith, Nikki the chef, and Nicolai, the first mate, who interact personably with guests, yet they know how to be formal at the same time. They are all water people; each grew up surfing (they are all from South Africa) they love fishing and pride themselves on offering good food…. All love to cook – all love kids, because kids like to have fun, but they charter to sophisticated adults, and providing elegant service is their number one priority. Nikki the chef worked in a 5 Star restaurant and and the food aboard the yacht is superb! Nikki is also a Yoga and Pilates Instructor, should anybody be interested in Yoga. 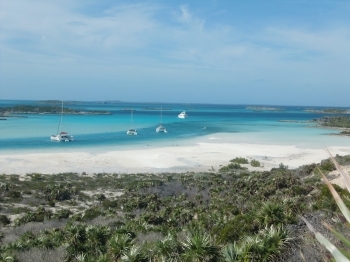 Arriving with them from the Virgin Islands are their inclusive rates. 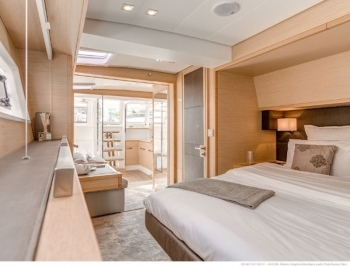 $34,000 a week for eight guests, which includes food, fuel, bar, dockage – everything (except 4% Bahamian tax) – a nice distinction from other yachts…. 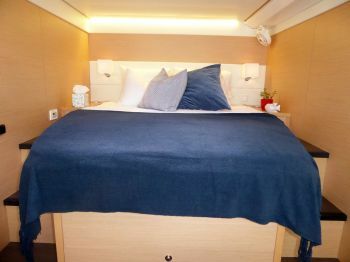 Because of the master stateroom, TIGER LILY is perhaps best suited for families, but four couples can also be accommodated in four Queen cabins, each with private bathroom and many amenities. 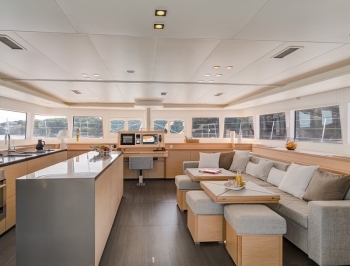 TIGER LILY is one of our favorite decorated Lagoon 62s with Octopus throw cushions and soft leather upholstery, made all the more chic by the placement of the galley and island along the port side of the saloon. 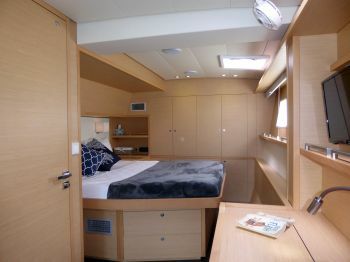 The lines are clean and minamalist, and they lead aft to a large, covered cockpit, over which is a very comfortable fly bridge with weather curtains and cocktail seating and sunbathing, and forward to the foredeck trampolines, which offer sunbathing. Among the wide array of water sports offered is a Sunfish sailing dinghy and two Sea Bobs. 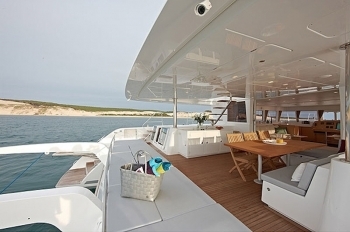 TIGER LILY will return to the Virgin Islands in the fall…..
Cameron is a confident and knowledgeable captain that has logged over 30,000 nautical miles during his yachting career working on board motor and sailing yachts. He is known for the ability to remain calm and retain his poise when handling challenging issues. While taking great pride in his position, Cameron is passionate about cooking and would be thrilled to serve the guests with an original South African braai. 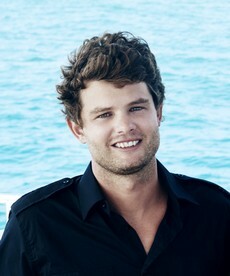 He also finds enjoyment in making people laugh and is as comfortable entertaining guests as he is at the helm. In addition to earning his RYA Yachtmaster Offshore, he is a licensed PADI Dive Master and Commercial Diver Class 2 that loves water sports of all kinds, surfing included. Guests eager to take out the water toys can be assured that Cameron will show them a thrilling time. 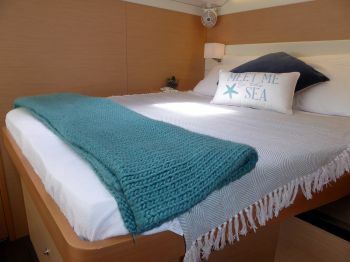 Cameron will make certain that every holiday spent aboard TIGER LILY is nothing less than perfect. 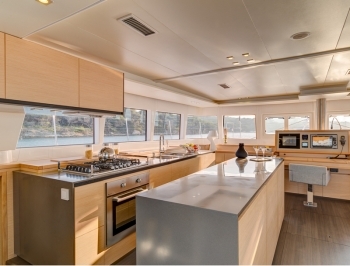 With an infectious warm and sunny disposition, impeccable eye for detail, and outstanding prowess in the kitchen, Nikki shines as an exceptional yacht chef and hostess. Through positions held in the charter industry and with a background in hospitality working at a five-star hotel and restaurant, she developed refined culinary skills and a commitment to delivering flawless service where guest needs take priority. Passionate about food and travel, Nikki takes great pleasure in preparing dishes that are internationally inspired and incorporate local flavours and ingredients. She also excels at adapting menus to suit special dietary restrictions and preferences. Nikki is also a certified yoga and pilates instructor and is always thrilled to treat the guests to relaxing onboard sessions. Always delivering first class service that goes above and beyond, Nikki will ensure that guests enjoy every moment of their stay aboard TIGER LILY. 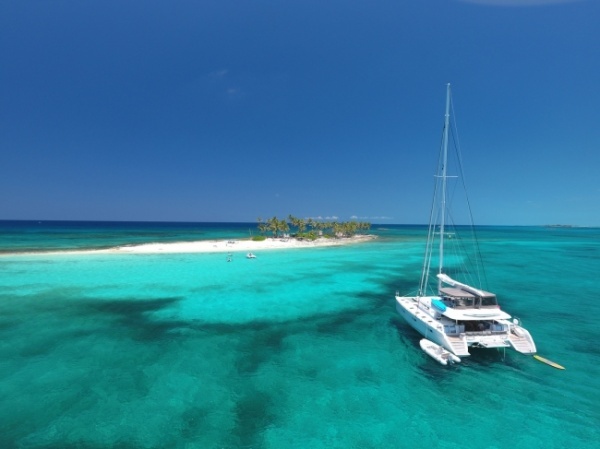 The crew of TIGER LILY is one of the best teams to be found on charter yachts as its members have known each other since childhood years and understand one another without words. Together, they create a most welcoming and warm atmosphere which makes every guest feel comfortable and cared for.